Hailed as "the most significant memory invention of the decade", magnetoresistive random-access memory or Mram could one day overthrow hard discs and flash memory. To understand why Mram is potentially so exciting, let us look at the ways we currently store data. Take one desktop computer, and carefully disassemble it. The random access memory (Ram) is short term memory, it handles the data the computer needs right now to do its calculations. Reading and writing data to Ram can be done extremely quickly. But it is volatile, which means it needs constant power to store data - when you switch the power off, kiss goodbye to your data. And then there is flash memory, which is great for storing moderate amounts of data, even when the power is off. It is non-volatile, so it is useful in portable devices like mp3 players and cameras. It is also robust, so you can sling it around in portable devices. Its main drawbacks are that it is very slow to write data to, and it also wears out. So depending on our needs, we have two ways of storing data, which both have disadvantages - they are either slow, or lose data when the power is off. What would be lovely is a type of memory which is both fast to write, and non-volatile. So, along comes something called magnetoresistive random access memory or Mram. It's not going to be something you put into a PC for some time. A couple of weeks ago a company called Freescale announced that it had produced a working Mram chip which can hold four-megabits, that is about half a megabyte. It is very small compared to the Ram and flash chips on the market, but it is a start. 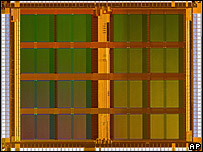 In fact many companies, including IBM, have been working on the nanotechnology behind Mram for around a decade. Put simply, Mram stores data magnetically, in the same way a hard drive does. This makes it non-volatile. It is also very quick, and does not wear out over time. So it seems to have the advantages of both RAM and flash, with none of the disadvantages. No wonder the tech press got very excited about it. However, according to technology writer Guy Kewney, it is unlikely that Mram will replace every other form of storage anytime soon. "It's going to be important if it catches on in one or two small areas which let them get into volume first but those aren't going to be PCs. "It's not going to be something you put into a PC for some time." As the Mram chip is in a new format, and too small and expensive for home computing, a likely use for it is as a smart chip which are used in applications like travelcards. "The point about those smart chips is they don't have a battery in them," explained Mr Kewney. "They can't work until they come into the RFID (radio frequency ID) field which energises them and they have to work rapidly before the chip goes out of the RFID field. "In that time there are several things you've got to do; you've got to fire-up your wireless, you've got to make contact, go through protocols and then you've got to read the data and write it. "And the more data you can write the more complex the application can be. "With flash being a lot slower than magnetic ram there's a limit to the amount of magnetic ram before the ticket is out of the way."